The TLGTA ladder is back! We will be running two ladders, one for A/B level players (3.5 and above) and another for C level players (3.5 and below). You are only allowed to join one ladder. The winner of each ladder will receive a trophy and a prize at the AGM/Banquet in late October, as well as eternal bragging rights. Anywhere you and your opponent agree to play. This year's ladder will be run using the Elo Rating system. Each player will start with 1500 points, which will increase with each win and decrease with each loss. The amount of points gained or lost from a match is dependent on the points of the opponent played. For example, if a 2000 point player beats a 1000 point player, very little change will occur to either one's rating. However, if a 2000 point player loses to a 1000 point player, both players' ratings will change drastically. A player's points will also change drastically during the first few matches recorded. This allows players to reach a stable equilibrium quickly. Once you are on the ladder, you can challenge whomever you like. You have 7 days to accept a challenge. After 7 days, the challenge is automatically declined. For each challenge you decline, you lose 100 points. Everyone on the ladder must play at least once every 30 days or you will lose 100 points. After a challenge has been accepted, you have 21 days to play the match. Forfeited matches will count as a loss and effect your points as well. You can play the same opponent no more than twice in the season. The winner must submit the score. Double Dipping is allowed. Meaning if you are playing someone on the ladder in another forum (TLGTA club tournament, GLTA tournament, OTA, Team Tennis, Intercounty, etc.) and you both agree before you play to count it for the TLGTA ladder, you may do so. It must be a singles match. Regular match format of best 2 out of 3 sets, with a regular tiebreaker played at 6 games all. No Pro Sets (sorry Consolation players). 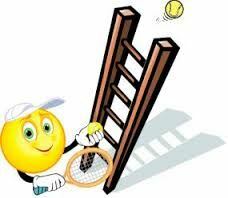 Our ladder will be managed on the Global Tennis Network website (GTN). 1. Log in or create an account with the Global Tennis Network. It is free. 2. Request to join the TLGTA Network. 3. After your network request has been accepted (may take up to 24 hours), then you can select one of the following ladders to join. Please note there are only 37 spots per ladder.